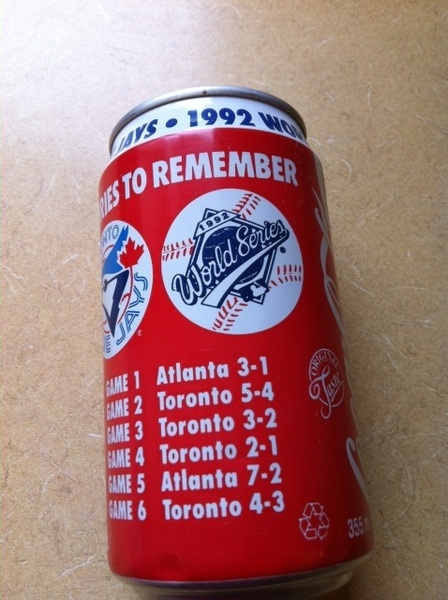 While the picture above is not the actual can I own, I do still have in my possession a 1992 Toronto Blue Jays Word Series Coke Can. Little did I know back in the day how valuable pop (or soda) cans could be in the future. The unopened cans are particularly valuable (especially if it is factory error), but like trying to keep an action figure in it’s original packaging, who can resist downing 24 cans of Pepsi in one sitting? It’s basically impossible. Had I resisted over the years, I could have made on mint on eBay selling these cans apparently. I mean think how much more Dr. Pepper I could have bought with $25,000! So, as dumb as it sounds, save your Twilight (or whatever terrible movie is on Coke cans these days) and World Cup 2014 Cans (unopened) because they could be worth something some day….and if they’re not? Hey, at least you’ll have 20 year old Coke to drink. It’s Win/Win! Apparently there are only a few of these floating around in the world. Just like the perfect man, Am I right ladies? The fact that the can is unopened, it’s from The United Arab Emirates and that it was pulled from the shelf after a week because the tour was cancelled makes this can potentially valuable. They are probably worth a lot more if they belonged to Bill Cosby. I have the 1989 Ghostbuster coke can does any one want to buy it? I have a unopen coke can from 2015 that has a football player and ESPN collage gameday on it. I would like to find out how much it is worth and where could I sell it. I have a 1993 diet coke six flags unopened winning talking can any idea what it’s worth? I have a unopened “rare aluminum” bottle of coke from Vancouver 2010 Olympics. what are you asking for them. were they empty when you got them or just evaporated over time? I have an empty, factory sealed 2004 coke can, is this worth anything before I toss it? ?